These motorhomes are positioned at the top of the RV arena as far as interior space, comfort and amenities are concerned. They’re also the most expensive. A Class A starts as a rolling chassis with a powertrain, axles and a driver’s position with a steering column and hookups for the dashboard. 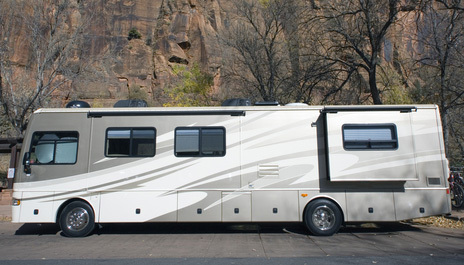 The RV manufacturer adds the entire coach body from bumper to bumper, so there is a lot of flexibility. Little is left out of a Class A. These rigs are fully self-contained and include the living amenities you’d expect in an RV. The lower-cost rigs have similarly-priced features and less “extras” than the high-end luxury models. The principal drawbacks to these vehicles are cost, storage considerations, fuel use and maneuverability. As long as these factors are acceptable to you, a Class A can’t be beat for the ultimate in traveling comfort.